Yesterday was the final day of service on the Texas Supreme Court for Chief Justice Thomas R. Phillips. I had the pleasure of practicing (albeit only very briefly) with Chief Justice Phillips just before he took the bench of the 280th District Court of Harris County. I was pleased to handle the Fifth Circuit appeal of a First Amendment case that he'd won in the trial court as a practicing lawyer, and later appeared in his court on behalf of the plaintiff in a case that had my all-time favorite case-name, The Who v. John Doe (which I've been meaning to blog about since last September). 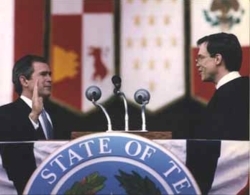 When he was appointed to the Texas Supreme Court in 1988, Chief Justice Phillips was the youngest Chief Justice since Texas joined the Union, and his re-elections in 1988, 1990, 1996, and 2002 were well deserved. It's not an overstatement to say that Tom Phillips led the Texas Supreme Court out of national disrepute, and although he has generally been known as a "judicial conservative," he's earned praise from both sides of the political aisle for his thoughtfulness and lack of dogmatism. In the State Bar of Texas 2002 Judicial Poll, for example, Chief Justice Phillips outpolled the combined votes for his two opponents by more than a two-to-one margin and received the most votes of any of 53 appellate judges who were rated. Chief Justice Phillips' resignation from the Court was entirely his own decision — I believe he could have been re-elected for as long as he cared to run — and I know he'll be missed by his colleagues. But I'm sure he'll enjoy and prosper in his new position as a distinguished visiting professor at South Texas College of Law, and I would not be surprised to see him again pick up the cudgels as a trial lawyer some time in the not-too-distant future. I think Dubya ought to nominate CJ Phillips for the vacancy when CJ Rehnquist retires.